Inchoo’s CEO Tomislav Bilić accepted the Best SME in Eastern Croatia award on the final event of this year’s “Business Take Off” project organized and managed by national business newspaper and portal Poslovni dnevnik and Croatian Ministry of Entrepreneurship and Crafts. It’s always nice to get the recognition for the hard work you’ve been putting in. And when it comes rather unexpected and on a national level, it makes things just a bit sweeter. You can learn more on this prestigious award below. Business Take Off – who and why? It was a rainy early December evening in our nation’s capital Zagreb and Tomislav and I drove from Osijek to represent Inchoo at the final event of a new project “Business Take Off” that strives to support small and medium-sized enterprises operating in various industries across Croatia. With a rather poor overall business climate in our country and the fact that people can’t see many examples of good, honest, hardworking companies who do well in these times while also keeping an eye out on the broader community rather than just looking after themselves, this project was created with the initial goal of promoting successful entrepreneurs and their business stories. This should be built upon with new activities around business education programs tailored to the needs of specific industries these companies are operating in so that the overall positive impact of the project gets multiplied. We’ll see how this project rolls out in the years to come. Who’s the best and on what criteria? 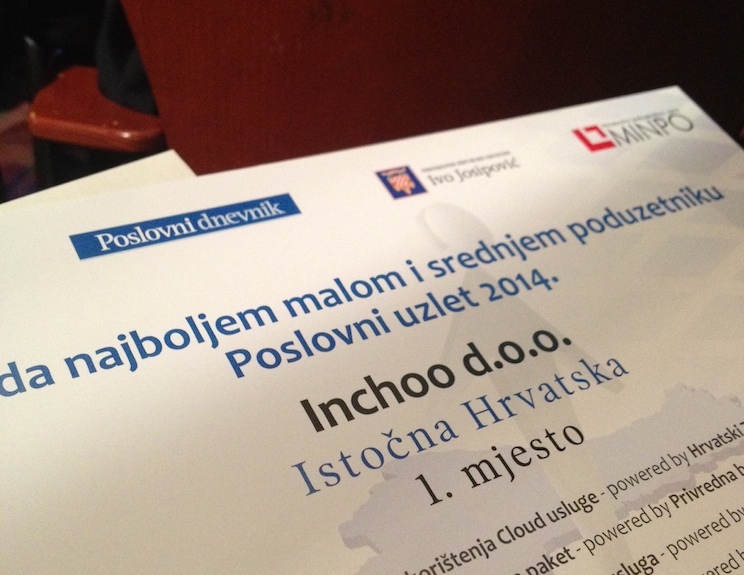 Inchoo was selected as the best among all small and medium-sized companies in Eastern Croatia that made the cut – and who actually made the cut? This project aims to identify first and foremost all those companies that have shown stability and growth over the last five years, those whose paychecks are coming in regularly (yes, that’s a big deal over here), have above average salaries, are operating with a profit, have no outstanding debts and are in general in good standing. And that’s how the final list was created with us emerging on top. We’re excited to see that our work around growing a stable company who acts as a reliable business partner has been recognized, and that our efforts around sharing the optimism in our local community are starting to pay dividends. And we also recognize the fact that our business growth has been tied to the success of Magento eCommerce platform and its ecosystem we’ve been a proud part of all these years. We would like to give special thanks to all of our current and former employees and clients for being integral pieces of the puzzle that makes Inchoo what it is today. This award comes as a validation of our work and at the same time a challenge to work even harder in building a sustainable company and creating a positive influence in our communities. We look forward to what lies ahead!